These muffins are super easy. They take about 10 minutes to prepare and around 20 minutes to bake. I would not recommend using frozen strawberries in this recipe, because they release a lot of moisture as they thaw. 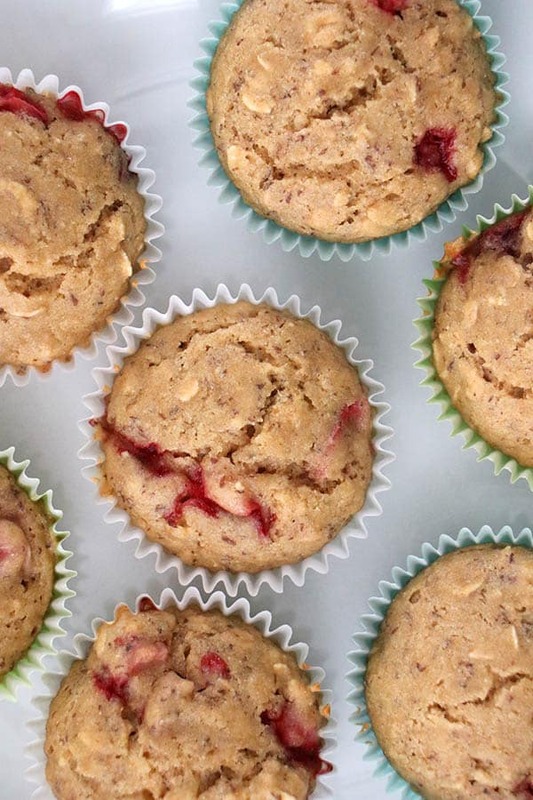 Frozen berries could yield mushy muffins, and that’s not what you’re going for here. 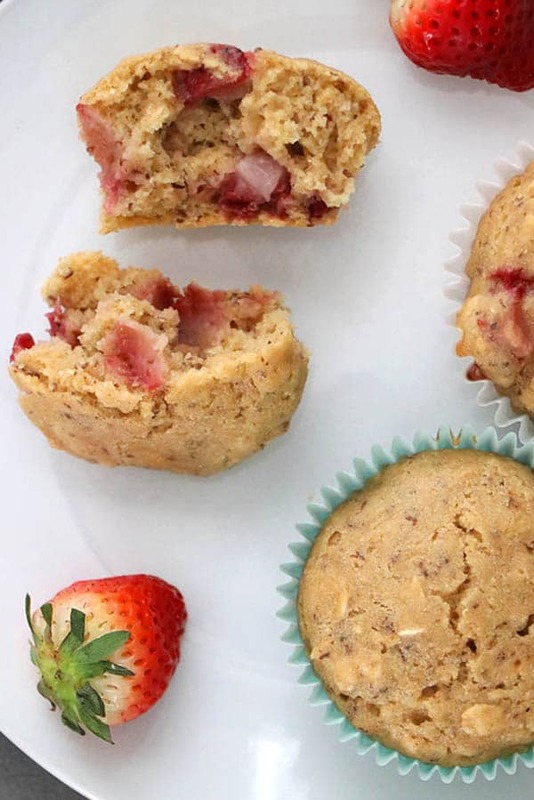 Fresh strawberries are where it’s at when it comes to these muffins! Start by chopping up your strawberries into pea-sized pieces, then it’s time to mix your dry ingredients, then the wet. Combine the wet and dry, fold in those berries and you’re ready to pour into your muffin pan and bake. If you’re like the Roses and don’t totally know what “fold in” means, don’t panic. Folding is a technique for incorporating ingredients without jostling them too much. In this case, you don’t want to mush up the berries with a vigorous stir. Just gently add them to the batter, so they stay intact. 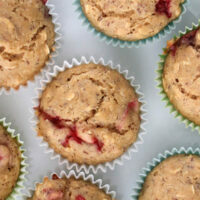 Once you’ve made your muffins, you want to make sure you store them properly, so they’ll last. The first step to storing homemade muffins is to let them cool completely. If you immediately transfer warm muffins to your storage container, you’ll end up with condensation. 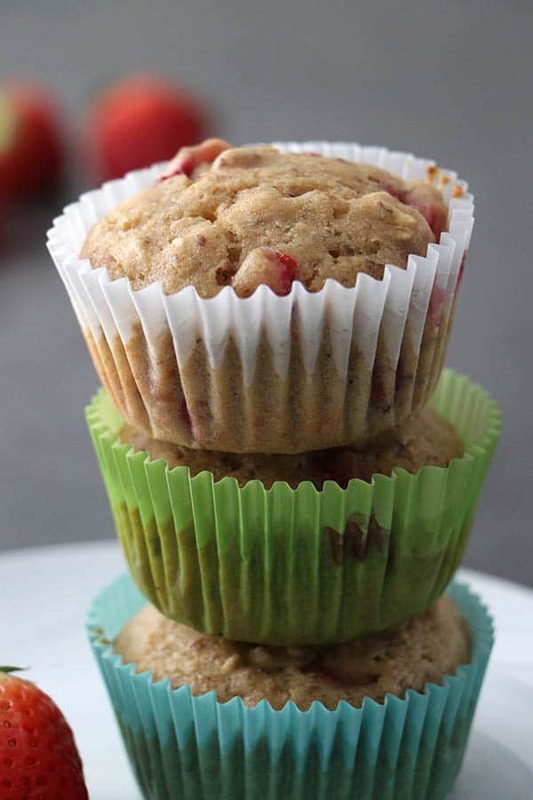 That extra moisture will make your muffins mushy and cause them to spoil faster. Once you let them completely cool, transfer your muffins to an airtight container, like a zip-top bag or lidded container with an airtight seal. They will keep at room temperature for around three days. You can also store these in the fridge to buy yourself another day or two. If you want to keep these for longer, you can freeze them. Transfer your totally cooled muffins to freezer bags and gently squeeze out excess air. They’ll be good for around three months. You can wrap them in foil and reheat at 300F for 15 minutes to thaw when you’re ready. 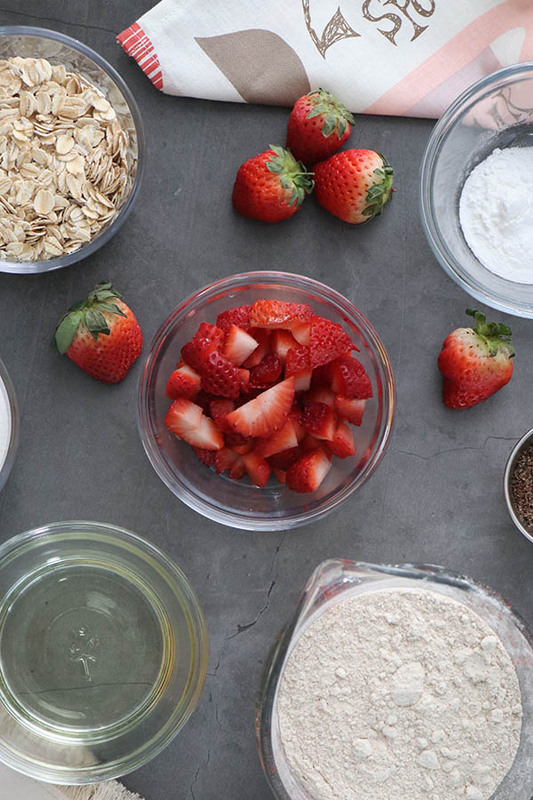 1 cup chopped fresh strawberries – You’re going for pea-sized pieces. In a small mixing bowl, whisk the wet ingredients together until they’re really well combined. In a large mixing bowl, whisk together the flour, rolled oats, sugar, and baking powder. Pour the wet ingredients into the bowl with the dry, and mix just until combined. Gently fold in the sliced strawberries. Spoon the batter a into lined muffin tin, filling each cup about 2/3 full. Bake on the middle oven rack for 20-22 minutes, or until a toothpick inserted comes out clean. Let the muffins cool for 10-15 minutes before eating. Thank you so much, Laura! 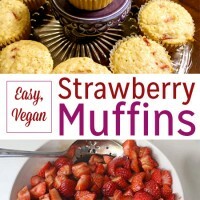 Welcome to the site, and enjoy your strawberry muffins! Okay, this is the perfect breakfast! Strawberries make everything better. Thank you, Cadry! And I agree – strawberries are the best! 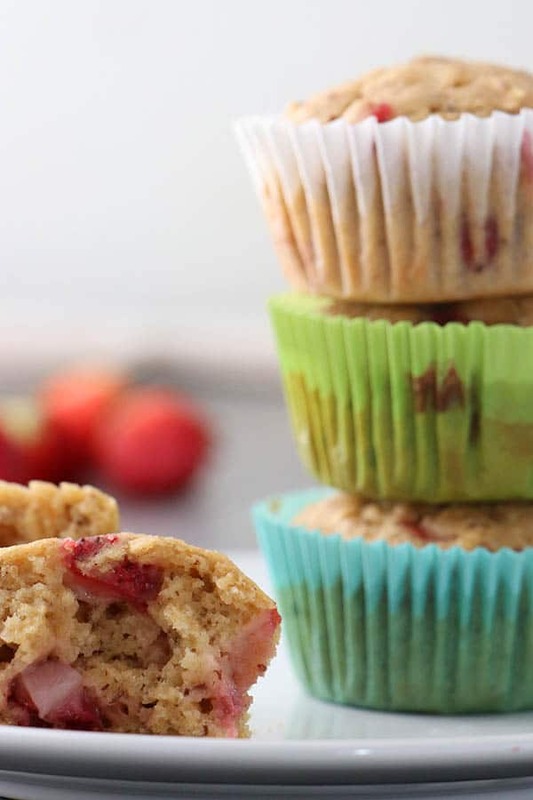 Strawberries are the one fruit I never think to add to muffins, but they’re so delicious! Thanks for this easy recipe! Right? Why do blueberries get all of the muffin glory? Yumm! Wish I had the foresight to plan ahead & bake on the weekend! Yeah!! Vegetable Husband has been working with some farms in north Florida to get us fruit each week! You got strawberries??!!!! My lord, I’m jealous! And the muffs are beautiful! They were fantastic! I ate three last night and I am about to go grab a couple more! I definitely recommend the chocolate chips! 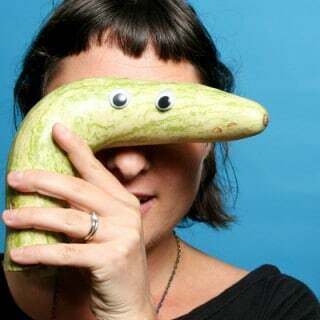 Oooh…that’s a great idea! Let me know how they turn out! Okay, I never bake … but these looked so yummy and easy (and I knew I had all the ingredients), so I immediately went down to the kitchen and whipped up a batch. They are in the oven now. Can’t wait to try them! p.s. I added a handful of dark chocolate chips.